Like all of our “Plants of the Month’ this January, we are picking those plants that have withstood those nasty cold snaps (believe us, our tropical plants are looking just as bad as yours are right now!) and still are providing us with some color. 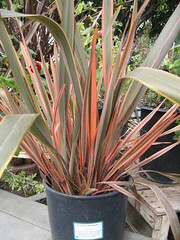 With that in mind, our plant of the week this week is Phormium ‘Sundowner’. We are big fans of phormium, or ‘flax’ as they are commonly called, These New Zealand natives are a GREAT addition to any garden – their blade like leaf structure provides much needed contrast and interest to any landscape, and they come in some spectacular colors. We love Sundowner for its very awesome pink and green and brown shades – very trendy colors for all design this spring, we might add! Phormium Sundowner takes full sun to part shade, little to moderate water and this giant variety (there are also ‘dwarf’ phormiums that only grow to two or three feet) can get up to 6 to 8 feet tall and another 3 to 4 feet wide, depending on where it is planted. And, as we said, it is cold hardy – the grower says it can withstand cold of 15 to 20 degrees, and it appears to have done fine in our garden during those nights early this month with the temperature dipped below freezing. Plant it at the back of your garden for some spectacular looking color and foliage – and yes, we do have it in stock right now!!! !